Missionary Jeff Tideman easily recalls the time it took six hours to drive 80 miles during a missionary trip in Mozambique, Africa. That grueling road trip and others like it sparked an idea in Tideman: Why not fly? 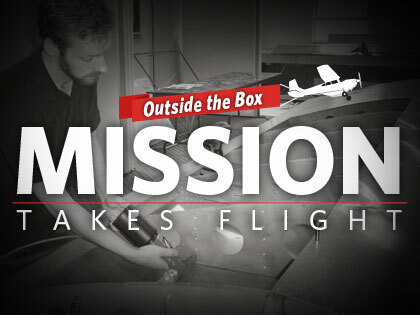 To that end, River of Life church in Clarendon Hills, Ill., is building a small airplane. Tideman, a flight instructor, says the Zenith CH801 doesn’t need a runway. It can take off at a distance of 390 feet and carry up to 1,000 pounds of supplies, such as medicine and food. The small Baptist church, home to about 30 families, relies on donations and volunteer manpower to fund the roughly $60,000 effort, which is halfway complete. The project even doubles as outreach, as the church hosts open houses for strangers to pop in and help build—and they do. “It’s been amazing,” Tideman says. Since the early 1940s, Mission Aviation Fellowship has been bringing aviation and technology to the world of Christian missions, making it possible to serve isolated people in Africa, Asia, Eurasia and Latin America. MAF works with pilot missionaries and their families to provide medical assistance, disaster response, community development, training and evangelism support to churches.